If deer are color blind why wear camo? A question that comes up in the frequent and never ending debates about which camo pattern is best. I decided to do some research on the science behind camo and deer vision. This article explores what I learned in depth. The bottom line is that deer are not completely color blind but they are primarily green-red color blind. The two major takeaways from this article are 1) do not wear blue, and 2) watch out for UV brightened clothing. Before jumping into the discussion on deer vision, it is important to understand what color blindness is and what causes it. Color blindness is when the eye is unable to distinguish different wavelengths (aka colors) of light. The eye senses light through two types of cells located in the rear of the eye in the retina. These two cell types are called cones and rods. Rods are for low light situations like night. Cones are for high light situations and for distinguishing different colors. Deer are not color blind but their vision is different from ours. Research by the University of Georgia has found that deer eyes have many more rods and less cones relative to humans. The high number of rods help them see very well at night. The trade off of having more rods and less cones is that they are not able to see color as well. 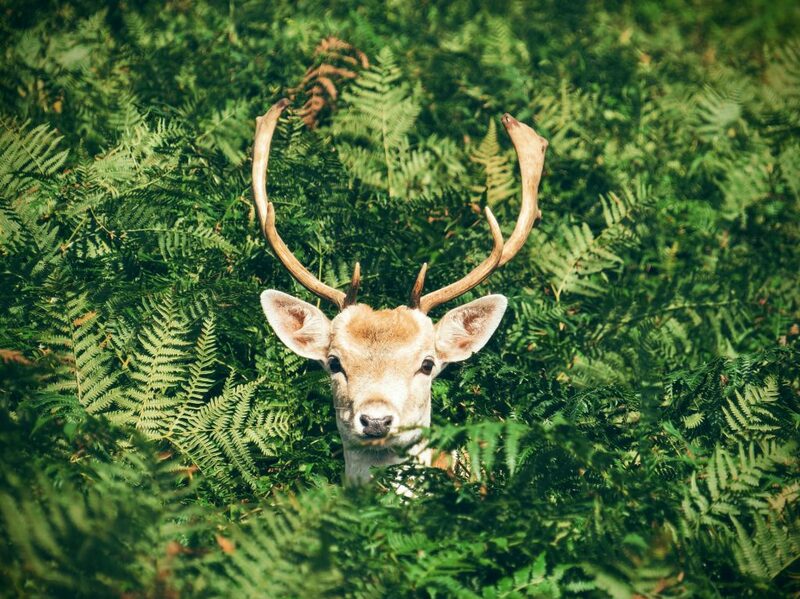 Deer’s vision has adapted this way because it is helpful to their survival. Humans have 3 types of cones allowing us to see red, green and blue. Deer on the other hand only have two, one for seeing blue and the other for seeing red. Having less cones results in deer being unable to distinguish the difference between green and red but they can see blue quite well. For more detailed info on the study take a look at the article on Quality Deer Management Association [QDMA Link]. Another drastic difference between humans and deer is that deer have a much larger field of vision. They can see approximately 270 degrees around them, minimizing their number of blind spots and protecting them from prey. Humans on the other hand have about 180 degrees of vision. Can deer see blue jeans? Based on the research, deer can see blue jeans quite well. You may have had a lot of success or heard stories of hunters doing well in nothing other than blue jeans and a flannel. But the science says deer’s eyes are quite sensitive to blue so it is best to avoid wearing while hunting. Can deer see UV emissions from hunters clothing? Another finding from the research discussed above showed that deer lack a UV filter in their eye. This means their vision is also sensitive to UV light. In low light situations, clothing emitting UV will cause the hunter to “glow” from the deer’s perspective. Many clothing manufacturers use UV brighteners in their clothing. In addition, a lot of popular detergents also use UV brightening agents. If you are unsure whether your hunting clothing contains UV brighteners it is best to use a UV killer to prevent the glow. I looked into possible homemade UV killers and the conclusion I came to was that it is easier to spend the money and buy a solution I know works. The time and uncertainty whether a homemade solution will work (or damage my clothing) is not worth saving a few bucks. The UV Killer by Atsko works great in my experience [Amazon Link]. It does not remove UV-brighteners but instead it applies a permanent, transparent UV absorbing coating. Is camo necessary for deer hunting? Camouflage works but how important is it? Relative to scent and movement control, camouflage is not as critical. But if we are trying to do everything we can to maximize our chances of success in the woods, camo helps and is worth some discussion. Are some camo patterns better than others? The ASAT (All Season All Terrain) camo pattern is a good example of what to look for in a camo pattern. The pattern uses large shapes with high contrasting brown colors. While this may seem visible from up close, this pattern excels at breaking up the outline of the hunter, making him appear more natural. As the hunter gets further away, he will appear more and more like a blurry blob that is hard to detect. Amazon has a good selection of ASAT camo. Check out some examples of ASAT camo here [Amazon Link]. Digital camo has risen a lot in popularity in the past 15 years because the military started using it. While at the United States Military Academy Dr. O’Neill helped develop what went on to become known as digital camo. Why do hunters wear blaze orange? As you might suspect, the reason hunters wear blaze orange is to protect them from other hunters. Because of the many shooting accidents that happen every year, we should take any precaution we can. One situation that can be particularly dangerous is when a hunter is moving a buck he killed. I have started anchoring a piece of blaze orange clothing to the deer’s antlers in hopes that other hunters will better see me. I have even heard horror stories of horses getting shot at during elk season so it is a good idea to fit any animals you bring hunting with some blaze orange as well. Do I have to wear orange at all times? Whether you have to wear orange or not depends on the state you live in. Some states like Montana require hunters to wear a specified amount of orange at all times while hunting. Other states like California do not require hunters to wear blaze orange at all. There are also states that only require hunters to wear orange while walking to and from their hunting stand. It is best to check with your local fish and game office. As discussed deer are unable to distinguish1 long wavelength colors like red and orange and can’t tell them apart from green. In theory there is no difference between green and orange from a deer’s perspective. So, what should I wear hunting? Anything but blue or UV brightened clothing will work. There is no denying that camouflage works but the research suggests it is not as important as avoiding blue or UV brightened clothing. The best camo pattern is the one that best mimics the environment you hunt in but don’t worry if it doesn’t match perfectly. Wear clothing that is comfortable and will do a good job of protecting you from the environment you are hunting in. Many of the high end hunting clothing brands offer lightweight high performance clothing. Their camo patterns are a bonus but should not be your primary motivation when buying. If you are going to spend the money for camo clothing, opt for a pattern with both high macro and micro contrast. This will offer you the best blend of performance from far distances as well as up close. Also, avoid wearing all black if possible. The outline of black will stand out in most terrains. The hunters I have spotted while hunting that stuck out the most have always been wearing solid black clothing. Even from a distance they look like a little floating black dot. And while deer’s vision is different than human vision, deer can distinguish black from the greens and browns they normally see. Deer’s sense of smell is significantly better than humans. Some research says they can smell 1000 times better than humans and are on par with dogs. While all the discussion about camo in this article is important, scent control is more important. My basic recommendations for dealing with scent control are 1) learn how to hunt with the wind and 2) use scent free detergent. My preferred scent free detergent is Scent-A-Way [Amazon Link] by Hunter Specialties. This detergent do not contain any UV brighteners and does a good job cleaning clothes. I highly recommend it. If you found this article helpful, checkout some of our other articles under Gear Guides.